Between October 2014 and May 2015, BDW implemented the STATE OF ART phase of the HUMAN CITIES / project, with the goal of building the capacity of BDW to encompass the capability to manage, as an independent citizens’ initiative, the project of public-private partnership on a satisfactory high level, and within an optimal time- and budget- framework connect citizen and users with project donors, creatives and executors, using the methodology of Jan Gehl and the IDEO HCD TOOLKIT for successful participation of citizens in the process of urban regeneration. 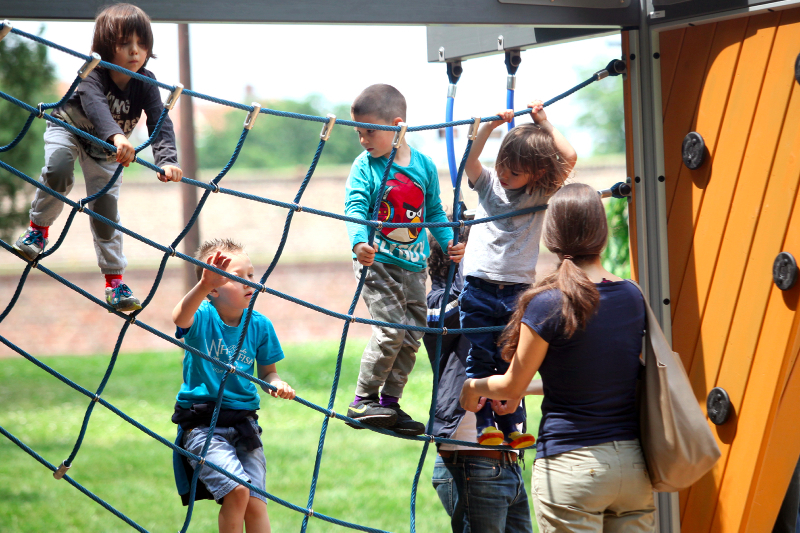 This exercise was successful, and BDW opened its most ambitious initiative to that point in a park in Belgrade – the creative playground in Kalemegdan in May 2015 – and called upon all public and private partners in Serbia and the region to support the continuation of the initiative. 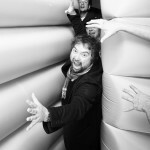 Here is the story about second creative playground for the children of Serbia. Foundations are making a huge comeback in Belgrade. 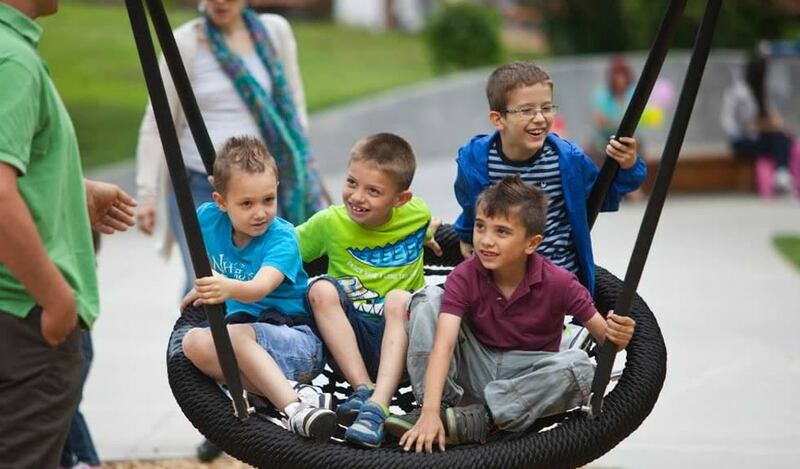 Following the decision to establish the commission for facades restoration which will be funded with donations, the City of Belgrade announced it continues the cooperation with Belgrade Design Week in building playgrounds for children, which will also be a modern form of endowment. 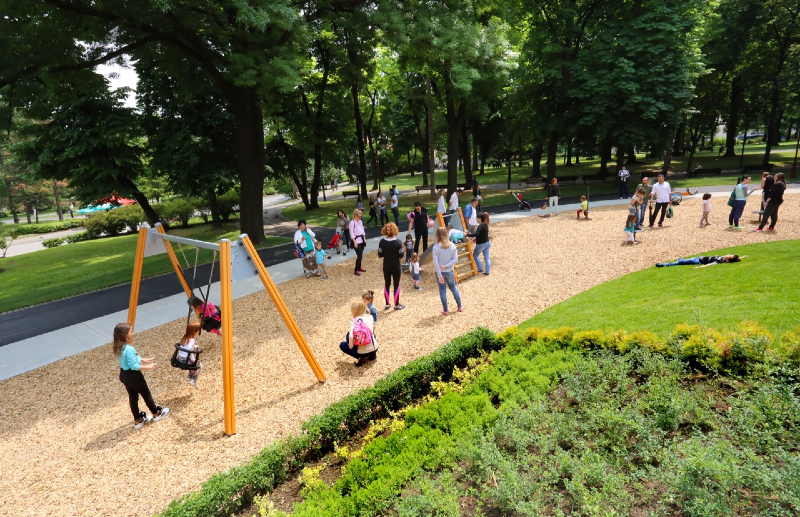 Thanks to a donation of “NIS a.d. Novi Sad”, the old playground in the centre of the famous Kalemegdan park in Belgrade, in front of the iconic Cvijeta Zuzorić pavilion – in desperate need of reconstruction – finally got the long awaited complete reconstruction, along with the new creative standards introduced by BDW in 2013 at the first Kalemegdan playground, only a couple of hundred meters away. Thanks to this new partnership between “NIS a.d. Novi Sad” and the City of Belgrade, the most important and frequented park and historic monument in the centre of Belgrade has finally reclaimed both of its traditional playgrounds for future generations, as it was custom for generations of people coming from all parts of the city to enjoy a play, as well as for tourists and visitors with children from all over the world. As a participant of the “Together for the Community” project, Belgrade Design Week, in collaboration with the City of Belgrade and the NIS corporation as main donors, the Embassy of Finland in Serbia and the Finnish company “Lappset” as partners, based on the project of the young architect Nina Radosavljevic, and built by the City Greenery of Belgrade, has provided a new, inspiring and safe place for children to play. The new BDW playground was opened on Sunday 24th May 2015 by Belgrade’s Mayor Mr. Sinisa Mali, the Ambassador of Finland H.E. Mr Pekka Orpana, the Deputy General Manager of the NIS corporation Mr. Evgeniy Kudinov, the Director of corporate communications of the NIS corporation Ms. Sanja Lubardic, the Belgrade City Architect Mr. Milutin Folic, the Secretary of Belgrade’s Communal affairs Ms. Nina Jandric, the General Director of Belgrade’s City Greenery Mr. Slobodan Stanojevic, and the founders of Belgrade Design Week Vesna and Jovan Jelovac. We hope that these two new cases of public / private partnership in Serbia, will inspire and encourage other companies and institutions throughout the nation, to become part of our project with own proposals, initiatives and donations, and that very soon our dream of “100 CREATIVE BDW PLAYGROUNDS FOR CHILDREN OF SERBIA” will become reality in many other places throughout Serbia. “Today we hand over to our youngest citizens a beautiful, modern, creative playground in our busiest and biggest park in Belgrade. Today is also the European Day of Parks, and a great opportunity to remind ourselves of the importance of green spaces and parks in our city. The City of Belgrade currently boasts 58 parks, the biggest of which is the one we are in today, the park of the Kalemegdan fortress, and it is my wish that we celebrate the next European Day of Parks with even more parks in our capital. I think it’s very important to pay attention to green spaces, to parks development and design. Over the past year we have organized many parks, but what is important is that in addition to parks, we also design children’s playgrounds. Parks, as green areas should be places where our fellow citizens spend their free time and use them for recreational activities, but those parks must have playgrounds like this one, so that our youngest citizens, our children, can spend their time being active. 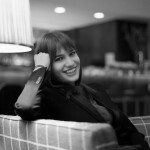 Sanja Lubardic, NIS Director of Public Relations and Communication. Boris Tancabelic, Director of the Lamda development’s Belgrade office.